Skip choosing individual elements for your home shower and fit the New Tempesta 100 wall holder with shower head, shower rail and hose as one package. 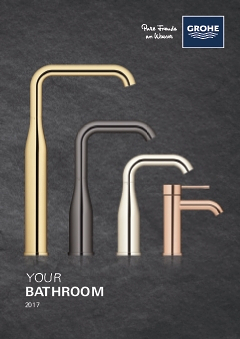 Beautifully designed and presented in the dazzling GROHE StarLight chrome finish, the fittings are also durable and so convenient to maintain. The protective ShockProof silicone ring prevents damage if the the shower head is dropped. The Rain spray transforms your shower into a luxury spa by enclosing you in the natural sensation of a soft, warm summer rain. The GROHE DreamSpray technology ensures each nozzle has the same flow and SpeedClean anti-lime technology prevents limescale collecting on the nozzles.